The decorative arts are arts or crafts whose object is the design and manufacture of objects that are both beautiful and functional. It includes interior design, but not usually architecture. The decorative arts are often categorized in distinction to the "fine arts", namely painting, drawing, photography, and large-scale sculpture, which generally produce objects solely for their aesthetic quality and capacity to stimulate the intellect. The distinction between the decorative and fine arts essentially arose from the post-Renaissance art of the West, where the distinction is for the most part meaningful. This distinction is much less meaningful when considering the art of other cultures and periods, where the most valued works, or even all works, include those in decorative media. For example, Islamic art in many periods and places consists entirely of the decorative arts, often using geometric and plant forms, as does the art of many traditional cultures. 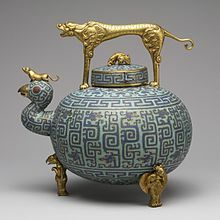 The distinction between decorative and fine arts is not very useful for appreciating Chinese art, and neither is it for understanding Early Medieval art in Europe. In that period in Europe, fine arts such as manuscript illumination and monumental sculpture existed, but the most prestigious works tended to be in goldsmith work, in cast metals such as bronze, or in other techniques such as ivory carving. Large-scale wall-paintings were much less regarded, crudely executed, and rarely mentioned in contemporary sources. They were probably seen as an inferior substitute for mosaic, which for the period must be considered a fine art, though in recent centuries mosaics have tended to be considered decorative. The term "ars sacra" ("sacred arts") is sometimes used for medieval Christian art executed in metal, ivory, textiles, and other more valuable materials but not for rarer secular works from that period. In the context of mass production and consumerism some individuals will attempt to create or maintain their lifestyle or to construct their identity when forced to accept mass produced identical objects in their life. According to Campbell in his piece “The Craft Consumer” , this is done by selecting goods with specific intentions in mind to alter them. Instead of accepting a foreign object for what it is, the foreign object is incorporated and changed to fit one's lifestyle and choices, or customized. One way to achieve a customized look and feel to common objects is to change their external appearance by applying decorative techniques, as in decoupage, art cars, truck art in South Asia and IKEA hacking. ^ "Arts and Crafts Movement". Encyclopædia Britannica. Encyclopædia Britannica Online. Encyclopædia Britannica Inc. 2012. Retrieved 5 June 2014. ^ Campbell, Colin. "The Craft Consumer". Journal of Consumer Culture 5.1 (2005). Print.